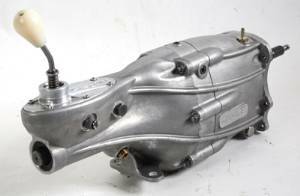 The new Quaife 5-speed synchro in-line RWD 'H' pattern gearbox has been designed as a direct replacement for the Ford Sierra Type 9 gearbox, and incorporates a modular gear cluster on 80mm shaft centres. Quaife has returned to its first principles with its new in-line 5-speed RWD gearbox, designed as a direct replacement for the popular Type 9 unit, but with larger shaft centres to accommodate higher torque and power outputs. The new QBE56G unit is available with synchromesh engagement and helical gears for road or light competition use. This universal fitment gearbox has overall dimensions as per the Ford Type 9 gearbox.